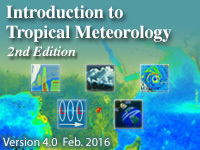 In this chapter, we examine the wide-variety of synoptic and mesoscale weather systems that affect the tropics, including, tropical easterly waves, upper tropospheric troughs, monsoon depressions, subtropical cyclones, westerly wind bursts, and cold fronts. Extratropical interactions, such as those caused by Rossby wave trains and the MJO, are examined. The chapter presents a review of thunderstorms and lightning. The structure, formation mechanisms, and impacts of mesoscale convective systems are examined. The distribution of lightning globally and within mesoscale systems is examined. Mesoscale and local circulations, such as sea-breezes, are explored. The final section focuses on severe local storms such as tornadoes and waterspouts. Very detailed- really enhanced my knowledge of synoptic and mesoscale features in the tropics.